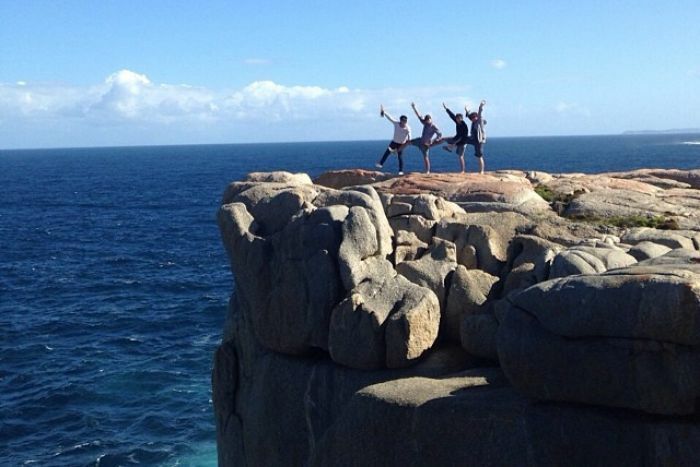 FRIENDS have watched on in horror as a man plunged to his death after attempting to take a selfie at the Gap in Albany WA. The international student, aged in his 20s, was “mucking around” with his mates when he fell 40 metres onto rocks at Western Australia’s notorious tourist hot spot, The Gap. He was then swept out to sea. “We were new here, we don’t know about that, they had just gone taking pictures,” the man’s friend, Sahil Khenchi, told the ABC. The incident has highlighted concerns shared by authorities around the world of tourists putting themselves in grave danger in an effort to capture the ultimate shot for social media. Insurance company Allianz has gone as far as to dedicate an entire page of its website to warn travellers of “dangerous selfies”. Some tourist sites have become popular at least in part due to their “dangerous selfie” potential. Wedding Cake Rock, an iconic landmark in the Royal National Park south of Sydney, became flooded with tourists in 2015 after selfies and images of people perched on the rock ledge began appearing on Instagram. Annual visitor numbers surged from 2,000 to 10,000 — many making the journey hoping to capture that perfect insta-worthy shot. Soon after the location was closed off for a month to the public after a geotechnical survey revealed the rock was unstable, and likely to collapse within the next decade. A year later, when the daring photo attempts continued (some people even attempted handstands on the rock edge) authorities brought in on-the-spot fines of up to $300 for visitors who ignored the warning signs or jumped the fence. Great Southern Police District Superintendent Dom Wood said an investigation into Thursday’s death in Albany was ongoing, and it would include discussions around safety warnings. But he said in this case it appeared the man, along with other members of the group he was with, had put themselves at risk by being outside clearly marked areas. “We know that they were on the eastern side of The Gap,” he said. Mr Wood said it was a tragic accident and hoped it would make people think before putting their safety at risk for a photograph. “We all know now there is a bit of a selfie culture and there’s a culture of people wanting to take as many snaps as they can,” he said. “Potentially people will put that activity ahead of their own safety. WA Premier Mark McGowan said the death was very sad and he felt for the man’s family, but believed there were enough signs in place at the location. “If you go there and you look at the pathways, you look at the platforms, you look at the fencing, it’s very well done,” he said.